We explain why the proposed "HK land for HK people" scheme, while superficially appealing to voters, won't work, and we again propose measures to make the housing and tax system simpler and fairer, including elimination of stamp duty and mortgage interest deductions, and land lease reform to open the market and lower the premiums on new leases. 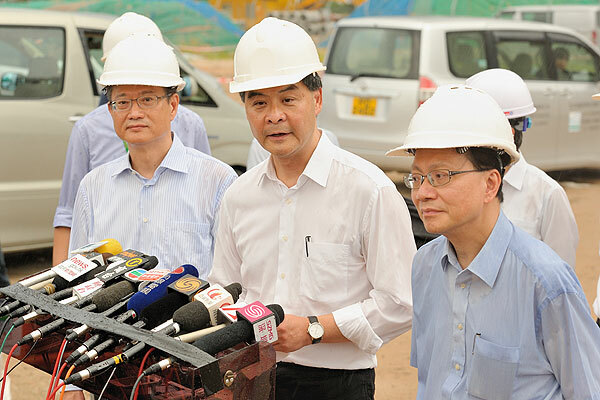 There's been a lot of talk lately about the proposed "Hong Kong land for Hong Kong people" (HK4HK), and tonight as we complete this article comes news that Chief Executive Leung Chun-ying has said that flats to be built on two sites in the Kai Tak former-airport development will be restricted to purchase by HK Permanent Residents (PRs) for 30 years. "We will study the introduction of a "Hong Kong property for Hong Kong residents" policy to assist those home buyers whose income exceed the limits prescribed by the Home Ownership Scheme. Under the proposed policy, new sites1 will be selected which are suitable for middle-class housing and in the relevant land lease a restriction will be included to the effect that the completed housing units can only be sold to Hong Kong residents2. 1. The proposal only focuses on new land supply and does not include redevelopment sites. 2. Hong Kong residents include non-permanent residents, i.e. those who have not yet lived in HK for 7 years"
We'll come back to footnote 2 later. Note that this was only a commitment to "study the introduction" of HK4HK - not to actually introduce it. As recently as July, newly-appointed ExCo member Barry Cheung Chun-yuen, a confidant of the CE and Chairman of the Urban Renewal Authority, was playing down the proposal. And back on 19-Jun-2012, the CE-elect himself said that non-HK residents were not purchasing properties in numbers that affect resident HK buyers. Let's start by assuming that the stated objective, to "assist those home buyers..." means to make home prices lower for them, rather than to help them with the paperwork or moving their furniture. The scheme's design implies that this can be achieved by creating a separate market in which overseas investors (non-residents) are excluded, and possibly excluding non-PR residents too. This carries the implicit and unproven assumption that overseas investors have caused prices in the unrestricted market to be higher than they would otherwise be, but we won't get into that debate now - it isn't necessary for the purpose of explaining why the scheme won't work. We should note though that any estimates you read about the proportion of home sales to mainlanders are only based on looking at the names of buyers (if they are not companies) in land registry transactions and deciding whether they "look like" mainland names. There is no requirement to disclose the buyer's immigration status or nationality in a property transaction, and keep in mind that there are already many PRs who migrated from the mainland more than 7 years ago, who are being lumped in with the statistics. If a HK resident can buy a flat in the scheme and rent it out, then it will be worth just as much as a physically-identical flat on an unrestricted land lease. Imagine that a HK resident owns 2 physically-identical flats, 1 in the HK4HK scheme, and 1 not. He is willing to rent them both out. As a tenant, which flat would you pay more rent for? Neither, of course - they are the same. As a tenant, you don't care about the ownership restrictions. Which one would give the owner a higher rental income? Neither, they are the same. So which one is worth more to the owner? Neither, they are the same. The Government could abandon footnote number 2 in the manifesto and restrict ownership and letting to PRs - it has apparently done this tonight (at least for ownership if not letting), but PRs are such a large subset of all residents that the restriction will not have any impact on capital value. If there were any discrepancy between the market value of an unrestricted flat and an otherwise-identical one in the scheme, then a PR who owned an unrestricted flat would sell that and buy the restricted one. It's called arbitrage, and it will keep prices in line. There are over 6.19 million adult PRs (we know this because of the harebrained Scheme $6000), although that includes people who no longer reside in HK - if you are also a Chinese national, then you keep your PR status for life, otherwise you can keep it by "touching base" in HK every 3 years (see paragraph 7, Schedule 1 of the Immigration Ordinance). There are probably about 5 million PR adults in HK, so that is not a big restriction. Non-permanent residents are a small minority in HK, basically comprising people who have lived here less than 7 years and about 300,000 Foreign Domestic Helpers who are not in the property market anyway. To reduce the value (slightly) below that of an identical flat on an unrestricted land lease, the HK4HK lease might prohibit letting the property to a third party. There are plenty of people willing to buy a home on the condition that they live in it, so it would only generate a small discount for loss of flexibility. The restriction would be worth even less if it expired after a fixed period within the duration of the land lease. Another possible restriction is limiting the scheme to first-time buyers (as the HOS does). Given the large set of people who have never owned a home (or are married to someone who hasn't), that would still leave a lot of potential buyers. If the restriction applied to all future owners, then there would have to be a bureaucratic verification process that subsequent purchasers are indeed first-time buyers, and if it only applied to the first buyer, then she could flip it. Another possible restriction is a lock-in, a prohibition on selling for say 5 or 10 years. When people buy a home, they expect to live in it for several years anyway (not least because of stamp duty and other transaction costs), so a short restriction of 5 years would not generate much discount. Besides, there is already a de facto lock-in on all residential property (new or old) - it is called Special Stamp Duty, which penalises resale within 18 months of purchase by seizing up to 15% of the value. SSD is unconstitutional because the Basic Law promises the right (implicitly without penalty) to dispose of property, but that hasn't stopped the Government from implementing it. Even if there is a lock-in, buyers of new flats in the HK4HK scheme could enter forward contracts (or equivalently, put-and-call options) to sell the property when the lock-in expires, thereby locking in any profit at the outset if the flats are discounted. This, by the way, is how male indigenous villagers in the New Territories lock in their profits on their small-house rights, by pre-selling to developers. With all that said, the Government could of course deliberately under-price the flats below their fair value (taking account of any owner-occupier and first-time buyer restriction). However, that would just result in massive over-subscription by qualifying residents, and a lottery to decide who gets the windfalls. If the Government wants to run a lottery for qualified entrants, then why not just offer cash by random draw instead? We could invite any resident (or any PR) to apply, allocate a pot of taxpayers' money, and conduct a lucky draw of say, 40 winners every Saturday on TV. Winners would get $500,000 to use as a down-payment on a private-sector flat. We could call it the "Billion-dollar Giveaway", because that would be the annual cost. If this sounds like a joke, that's because it is, and so is the notion that the Government should create such a lottery by deliberately discounting flats in the HK4HK scheme. What the Government probably would like to do is go much further, and restrict anyone without PR status from buying property. They wouldn't be the first to do so - Australia has a policy that foreigners can only buy new properties, which are deemed to "add to the existing housing stock". Of course this is just symbolic, because foreign purchases just displace (shift) demand from Australians into the existing stock, so the impact of overseas demand is no more and no less than it would be if foreigners could buy any Australian property. But it plays well at the ballot box. Oh yes - did we mention that there is a HK Legislative Council election on Sunday? Could it be that the CE rushed out the Kai Tak HK4HK announcement to please voters? It beats going to Vladivostok. However, if HK were to adopt a wholesale ban on foreign ownership of HK residential property (or at least, on any future purchases) then it would trash its reputation as a free market, and it would have to prohibit corporate ownership of property too, because otherwise companies could just be established by PRs and then sold to foreign buyers. Not only that, but it would be unconstitutional because it would violate Article 105 of the Basic Law, which says that it will "protect the right of individuals and legal persons to the acquisition" of property, which includes real estate. "Individuals and legal persons" - that covers anyone and any company, not just PRs. So the Government can put whatever conditions they like in new land leases, but they can't prevent foreign ownership of existing property and they know it. All of this micro-management of land lease conditions avoids a bigger discussion on principles. The role of Government should be to ensure that every resident (or at least, every PR) has a home, not that every resident owns a home. We must provide a social safety net, but it is not the role of governments to subsidise their people's investments in property or any other asset class. Ours seems hell-bent on doing so, on increasing home ownership, regardless of the costs or the impairment of economic efficiency. They seem to have learnt nothing from the housing crash in the USA which was partly the result of pushing home-ownership to unsustainable levels through various forms of intervention. Never mind overseas, the Government has learnt nothing from mistakes of previous HK administrations. On 8-Oct-1997, in his first policy address (paragraph 52), Tung Chee-hwa set a goal of 70% home ownership within 10 years, up from the existing rate of 52%. On 13-Nov-2002, his administration made a Statement on Housing Policy, abandoning that target and instead stating that "home ownership is essentially a matter of personal choice and affordability". This remained policy under the Tsang administration, at least until 2010. A consultation was then launched, and policy thereafter began to morph, with Donald Tsang announcing the My Home Purchase Plan in the policy address of 13-Oct-2010 and resumption of the Home Ownership Scheme in his last policy address on 11-Oct-2012. In any market economy, there will always be some people who, despite their best efforts, are unable to earn and save enough to own a home. In HK, you never actually own a home outright anyway - at best, you own a (usually fractional) interest in leasehold land. If social harmony is about ensuring that people have the security of a home, then Public Rental Housing (PRH) tenants are more secure than many HK residents, because as long as they need the flat and cannot afford to rent in the private sector, then the Government will let them keep it. PRH, which provides accommodation at deeply-discounted rents, is where the Government should focus its efforts, and on increasing and sustaining land supply for the production of private-sector homes. There is no reason why eligible PRH applicants should have to wait 3 years before being offered a unit. The Government seems to treat the waiting period as some kind of additional test, hoping that some people will leave the queue and go private. There should be inventory ready to go, and no waiting list, just a processing time of a few weeks. Many factors in housing prices (particularly the interest rate) are beyond the Government's control, but land supply is not one of them, and the fact remains that the median household in HK lives in about 500 sq ft gross (including their share of the lift lobby). Donald Tsang's stop-start policies on land supply are largely to blame for the slowdown in completed properties in recent years. What HK needs is a steady and predictable supply - a commitment to a 5-year rolling schedule of land auctions that will not be subject to stop-start intervention. "Subject to the overriding premise of maintaining stable property prices..."
Well, if you are not going to devalue existing properties, then you cannot increase supply faster than demand, so then there are only 2 options to make homes more affordable: either make homes smaller (and we submit that this has already reached its limits) or introduce various forms of subsidy, and that is indeed what they are pursuing. "For middle-income families, we will extend the period for tax deduction of mortgage interest from the present 10 years to 20 years, and raise the maximum interest deductible from $100,000 to $150,000." After C Y Leung wrote that commitment (not just a "study the introduction of"), the Tsang Government expanded the timeframe from 10 to 15 years in the budget (paragraph 60(6)) announced on 1-Feb-2012, at a stated cost of HK$540m per year over the next 5 years. This is presumably only the incremental cost for those who have already used their 10-year allowance. It is unfair because it represents a subsidy for investment in property, and that subsidy is not available if you rent a home rather than buy one, or if you don't take out a loan to buy one. It distorts the choice between renting and buying. "Some Members have again called for a tax allowance to cover spending on mortgage interest or even rental payments...it would be wrong in principle to create a general tax concession, regardless of the individual family's needs, to cover investment in housing"
Demonstrating his renowned ability to flip-flop his principles, he then introduced the deduction in the 1998 budget. Not only is it unfair in principle, but because of the non-flat salaries tax rate, the more you earn, the more the subsidy is worth. Also, the larger your mortgage loan, the more the subsidy is worth. That subsidy flows through to the banks, because it encourages people to gear up as much as possible, rather than minimise their borrowings. The rate of salaries tax ranges from 2% to 17%. You get a tax-free allowance of $120k each ($240k per couple) to cover a reasonable cost of living, and pay an average of 7% on the next $120k of income (in 3 equal bands at 2%, 7% and 12%), and 17% above that. So a couple can earn a combined $480k before paying the top rate. At current low interest rates of say 2.5%, a loan with $4m outstanding would maximise the deduction. Already, the 15-year $100k p.a. deduction at the top rate of 17% is worth $255k, and if expanded to 20-years at $150k, then the subsidy will double in value to $510k. If say 250,000 home-owners (in a private housing stock of about 1m homes) are able to take full advantage of it, then it will have cost a massive HK$128bn. If the intention is to raise tax allowances, then do it across the board, regardless of whether you rent or buy your home. In Feb-2011 Webb-site proposed a "Fair and Flat" reform of salaries tax to raise allowances and introduce a single flat rate, removing various unfair aspects of the system, including mortgage interest and the housing-benefit loophole. The new Government should take this forward. The ironic thing about the mortgage interest deduction is that the $4m loan that gets you that $255k tax break is enough (at a 70% loan-to-value) to buy a $5.7m flat, and the stamp duty on that is 3%, or about $171k. So the Government takes $171k out of your pockets up front, and then gives it back as a tax break over 15 years (you will probably change homes during that period, paying more stamp duty). Why not just abolish the stamp duty and the mortgage deduction? If it is the Government's goal to make housing affordable up front, then why do they charge buyers a hefty mark-up in the form of stamp duty? Above about HK$4.4m, the rate is 3%, rising to 4.25%. That 3% is equivalent to about 1 year's rent on the property, maybe a bit longer at current yields. As we have said before, the Government should abolish stamp duty because it is a frictional tax on the movement of assets regardless of whether the transaction generates a taxable profit. If they are not willing to scrap stamp duty, then why not at least exempt stamp duty for first-time buyers? That would cut their costs by about 3% immediately, equivalent to one tenth of the 30% down-payment they need on a flat. "Subject to adequate supply in the private housing market, we will consider introducing low interest or interest-free loans to assist middle-class families, subject to certain specified criteria, to purchase their homes in the private properties market"
Interest rates are of course already at record lows, and actually the criteria are not "certain" because he hasn't "specified" them. It is also unclear whether these loans would be made by Government, or just subsidised with interest payments to banks, but either way, it is a subsidy on people's purchase of property, and distorts the choice between renting and buying. Perhaps they would like to subsidise people's rents too? The proposal also begs the question: what is the point of offering a tax deduction for mortgage interest if you are going to make the loans interest-free? Another thing that is not beyond Government control is the financial structure of land leases, particularly the trade-off between land premiums and future ground rents. In 2010 we explained in detail how the development market could be opened up to greater competition, and capital costs reduced, by raising ground rents on new leases from 3% of rateable value to a more substantial figure of say 30%, thereby lowering premiums. The proposal has a number of other benefits detailed in the article. For homebuyers, the key point is that they get security of tenure, as holders of a Government lease, without having to pay so much up front. There is also the possibility of extending existing leases beyond their expiry date, offering increased certainty, in exchange for a commitment to pay higher ground rent after the original expiry date - and that would affect the CE sooner than most, because the land lease under his houses at 4 Peel Rise, complete with illegal structures, expires in 2038. That's 9 years before the mass expiry of leases in the New Territories granted before 1997. And another thing - that desirable property at Hotung Gardens that the Government wanted to buy: its land lease expires on 27-May-2033.